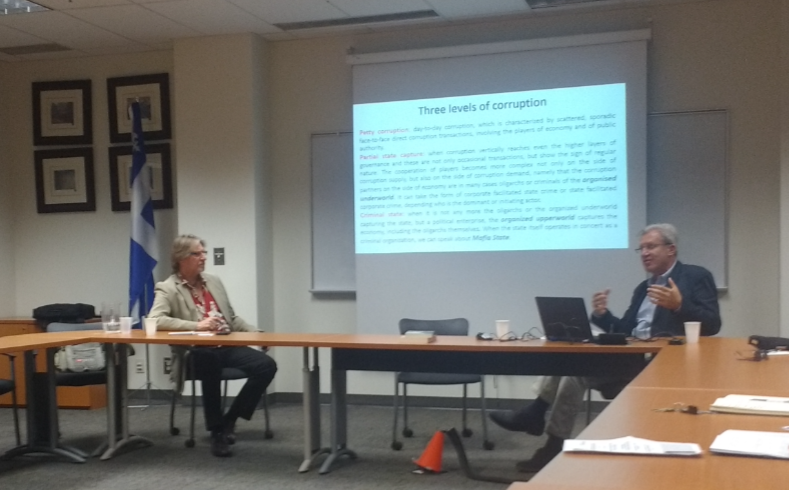 Bálint Magyar, Hungary’s former Minister of Education and author of the book Post-Communist Mafia State: The Case of Hungary, gave a well-attended talk at Concordia University in Montreal on September 11, 2017. The lecture was hosted by the Department of Political Science and moderated by a familiar voice from HFP, namely Professor András Göllner. The discussion focused on how one might describe the type of political system that has developed in Hungary since Viktor Orbán returned to power in 2010, as well as other post-communist autocracies. While noting that many have drawn parallels with both the Kádár and Horthy eras, Mr. Magyar emphasized that neither “fascist” nor “communist” are appropriate terms to use when defining the current Hungarian regime. Moreover, Mr. Magyar added that “illiberal democracy,” the term used by Prime Minister Orbán, implies that the system in Hungary is still a form of democracy and therefore not as insidious as it actually is. Mr. Magyar’s presentation, introduced by Professor Emeritus András Göllner of Concordia University, compared and contrasted the characteristics of different types of post-communist regimes in Eastern Europe and in the former Soviet states. He argued that many in the nineties believed in a linear progression towards liberal democracy, but very often this was an illusion. Corruption was a defining characteristic, the nature of corruption varied from one country to another–from pervasive, but ultimately petty corruption to partial state capture by oligarchs attached to those in power, to a full blown criminal state. The difference between partial state capture and a criminal state is that in the latter there is a complex political enterprise built, working in tandem with oligarchs. This is when “the state itself operates in concert as a criminal organization,” remarked Mr. Magyar. 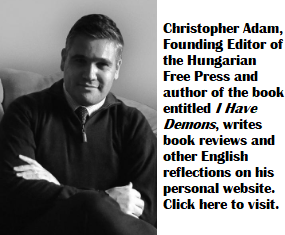 Hungary, the presenter argues, has become a post-communist mafia state, where there are no longer citizens, but only patrons, a patron’s court and an adopted political family. In this system, Hungary’s ruling Fidesz party is a political predator that has built a kleptocracy, where the system of checks and balances has been all but abolished. Having a system of proportional representation might help steer Hungary in a more democratic direction, argues Mr. Magyar, pointing to the fact that in 2014, Fidesz only needed around 43% of the vote to obtain a near two thirds majority of seats in parliament. What also might move Hungary away from autocracy is if the country had a more powerful president, elected directly by voters. Yet neither of these electoral changes are likely at all. The problem for democrats is what János Kornai argues: an autocratic government cannot be removed through a peaceful process. And while not yet a full blown dictatorship, Hungary certainly is an autocracy. A legal opposition exists, there is no open terror, such as large scale detentions or systemic, violent repression. But non-violent forms of repression are used against the opposition, the ruling party appoints its own people to all key positions, civil society is extremely weak and the freedom of the press is constrained by both legal and economic means. Mr. Magyar points out that Hungary might be close to the point of no return, but it is still not in the same camp as countries like Russia or Azerbaijan, which have passed this point. One other unique characteristic in Hungary is that Prime Minister Orbán has managed to build a post-communist autocracy out of a fairly successful liberal democracy. This is unique, as countries like Russia, Azerbaijan and other authoritarian states never had a true liberal democratic “interlude,” such as what Hungary had for some two decades. In this type of post-communist mafia state, churches and historic religious communities, be they Christian or Jewish, are either bought or blackmailed. A patron network dominates, there is a fusion of public and private interests and indeed the whole regime is based on this fusion. Most importantly: the state is built on informal collusion and informal institutions at all levels. In this regime, according to Mr. Magyar, “Orbán is the godfather, the chief patron.” There is a forced redistribution of wealth and opposition is co-opted in a number of ways. In Hungary’s case, and in post-communist mafia states, elections are manipulated, choice in elections is ultimately virtual and opposition parties are either marginalized or liquidated or else they are domesticated. Sometimes, parties are “simulated.” Anyone familiar with the 2014 elections in Hungary knows that a multitude of completely unknown “opposition” parties sprung up out of the blue from nowhere during the campaign and then vanished as soon as the election was over. It is widely accepted that these parties were created by the ruling regime, including ones that claimed to be social democratic and left-leaning in nature. At the end of the day, Hungary’s political system is built on “vassal” and “transmission belt” parties that have no real chance of dislodging the regime, pose no true threat, yet help create something of a semblance of multiparty democracy. From a legal perspective, Mr. Magyar explained that in contrast to the rule of law, in a mafia state, one sees a system of “rule by law.” As well, instead of normative law enforcement, one will witness individually tailored and selective law enforcement. Jurisdiction is politically selective and “kompromats” are used to discredit political opponents, where a decision to investigate a possible crime is taken on the basis of political considerations. One of the most thought-provoking angles of Bálint Magyar’s presentation in Montreal was his discussion surrounding the responsibility that liberals and liberal democrats bear for the rise of the far right and authoritarian politicians. Mr. Magyar, who was a co-founder of the Alliance of Free Democrats, Hungary’s now defunct liberal party and a key player in the transition to democracy in 1989/90, said that “doctrinaire liberalism” bears some responsibility for the rise of the populist far right. By dismissing tensions and fears in society as the musings of uneducated racists, people ended up finding a political home on the populist right. Mr. Magyar’s presentation attracted a diverse audience and a full room–from professors, researchers and students to local Montrealers of Hungarian origin, as well as diplomats. It certainly raised awareness of the nuances of Hungary’s post-communist autocracy and put the Hungarian regime into a comparative theoretical framework. The owl calls the sparrow big eyed ? Corrupt and bloody mass murderers what it was. In case you hope Hungary to be a civilized democracy soon, you are a dreamer. Very accurate work. Mr. Magyar is a defining scientific leader of the opposition. He stepped back as a politician to persue pretty much the same path where Prof. Göllner is working. Thanks for both of them for the not all that gratifying ground work what they have been working on. I wish I could see the video of this event, but I am pretty well informed on these thoughts anyways. More Hungary smearing carried out by some “patriotic” Hungarians. Hungary is a democracy in every sense of the way. The argument that the electoral system is unfair, would also make a country like Canada un-democratic. After all, technically speaking, a party could win a majority with only about 25% of the national vote in Canada, if that vote is spread out a certain way. As far as media freedom, I don’t think that one can currently argue that Germany for instance has more media freedom than Hungary. We all remember its national media compliantly remaining silent for five whole days in response to the 1,200 women raped & molested in a single night, while the authorities were trying to sweep it under the carpet. And now we have the extreme pressure put on Facebook to snuff out all anti-migrant dissent through extreme intimidation in the form of huge arbitrary fines. People are free to speak, to protest, to associate. So what is the problem? I mean, aside from the fact that the government in power is not the one that some Soros-worshiping, globalist-minded Hungarians would wish to see in power! As for the “mafia state” argument? If that were the case, the Hungarian economy would have never recovered from the state it was left in by the previous government. A healing economy is not generally a feature of a “mafia state”. I trust your comments made you feel better. If you had heard Bálint Magyar’s talk, and had been able to structure your rebuttals according to what was said in that room, rather than according to an imaginary lecture that exists only in your head, you may feel even better. Why don’t you give yourself an opportunity to shine and ask the editor for a copy of Dr. Magyar’s slides? Get your teeth into his argument, rather than swipe after imaginary flies with your eyes closed. Hungary is the only EU country where EU subsidies are chanelled through the Prime Minister’s office. According to the EU’s latest internal analyses, this is the country where the EU taxpayers’ moneys are most often stolen and misappropriated in the EU. On May 17, 2017 the European Parliament voted with a significant majority to do something it had never done in its entire history. It initiated procedures against Hungary under Article 7 of the Treaty of Europe, for systematic theft of community funds, and rule of law violations. Believe me, there is no reason for me to feel good here, given that I have to argue against fellow Hungarians, who think it is wise to smear the country’s image. You are right Sopron. Orban has been a “threat” to Hungary. Since he came to power in 2010, Debt/GDP ratio declined from 83% to about 74% currently. Not to mention that the FX portion of it has been cut in half, reducing Hungary’s vulnerability. Also, compared with Romania, which currently pays 4% on its 10-year bonds, Hungary now pays under 3%. I remember five years ago the MSM was full of stories praising Romania for sticking with the IMF, while Hungary decided to end the deal. More people are working in the private sector today in Hungary than there were any time in the past two decades. And those people working are registering double digit wage gains y-o-y. The consumer FX debt fiasco was fixed just in time, right before the Swiss Franc was decoupled from the Euro, hitting many in Central Europe. Birth rates increased from a low of 1.24 in 2011, to almost 1.5 today. What can I say, everything is going “wrong” in Hungary today under Orban. I suppose you think that you would prefer a return to the Gyurcsany years, when Hungary was headed in the right direction, with deficits averaging 7% and economic growth of about 2%. You don`t live in Hungary do you? With regards the figures supplied by the State….well, again, if you lived here then you would know that the dictator does not even understand the concept of “independent audit”. Well, Sopron, perhaps you do live in Hungary, but clearly you do not understand the basics of economics. If you would, you would understand the fact that most misery in Hungary from the past decade or so is the direct cause of the FX debt fiasco, at consumer & government level. One cannot have such a fiasco occur and not have misery occurring for years or sometimes for decades to come as a result. Just look at the US and the MBS fiasco. Obama was not able to just come in, wave a magic wand and make it all better. It was only in his second term that life for ordinary people started to stabilize and even improve slightly. Fact is that since 2014, with the forint stable at around 310/Euro, and with steady job gains, with solid wage growth, the lives of many people in Hungary improved greatly. And the best part about it all is that this time around, it is not on the back of another debt bubble, which as we saw with the FX debt fiasco, once it blows it actually leaves everyone worse off than when initiated. I’m intrigued by your critique of Sopron – ” clearly you do not understand the basics of economics” – especially after reading your own bastardization of the discipline. I would recommend you to read my piece on the actual performance of the Hungarian economy, published in Hungarian recently. It provides empirically verifiable evidence and a case for your dismissal as a credible witness. I shall translate it shortly for our English audience, In the meantime why don’t you get your teeth into it in your native tongue. Problem with your article is the fact that you seem to omit the effects the consumer and government FX debt bubbles have had on the stats you listed. If one looks at when Hungary fell behind Slovakia in many respects, one can see that it was in the 2006-2013 period (I know you will argue that Orban has been prime minister in 2010-2013, but let us not forget that when faced with a financial crisis, one cannot just wave a magic wand). Most of it can in fact be traced back to the after-effects of that bubble blowing up, which is the even where it all went wrong for Hungary. You omit the fact that Hungary has had an economic revival since 2013, with a stable currency, above peer-average real economic growth, and above peer average wage growth, while keeping its finances healthy, with debt/GDP declining every year. It is a very partisan, clearly heavily biased position, lacking any evidence of even some attempt being made to try to stay objective. It may convince the relatively ignorant and keep the already converted interested, but unlikely to have much effect with those who actually pay attention and keep informed. You may construct an echo chamber and convince yourself of the validity of the echo, but tends to be dismantled when it goes up against the facts, even if you will never recognize it. 3, “talpnyalók” those who always need a leader to admire, cherish and follow. A very great recent read is an interview, in Hungarian, with the outgoing Dutch Ambassador (http://bit.ly/2xfOvKK) . He openly questioned the EU’s financing of corruption (of Hungary). The consequences of the interview also tell a lot about the nature of the present Government. It almost declared war on The Netherlands (i.e. ceasing diplomatic relations on ambassador level and ordering back the Ambassador from The Hague, http://bit.ly/2xSKKh5 ) . No doubt why I have chosen Orwell’s 1984 as inspiration for my ID.